Everybody knows what makes the zebra a special animal, right? 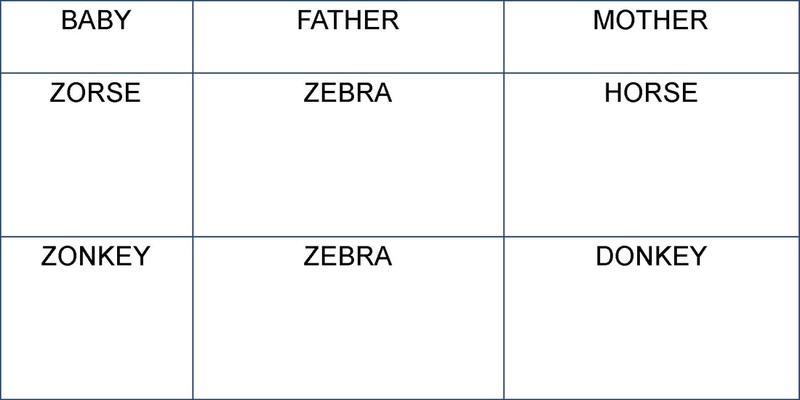 Since first grade, you’ve been told many times: Z is for Zebra. But just why is the zebra so special? Although closely related to horses, donkeys and mules, zebras are unique because of their bold black and white stripes. 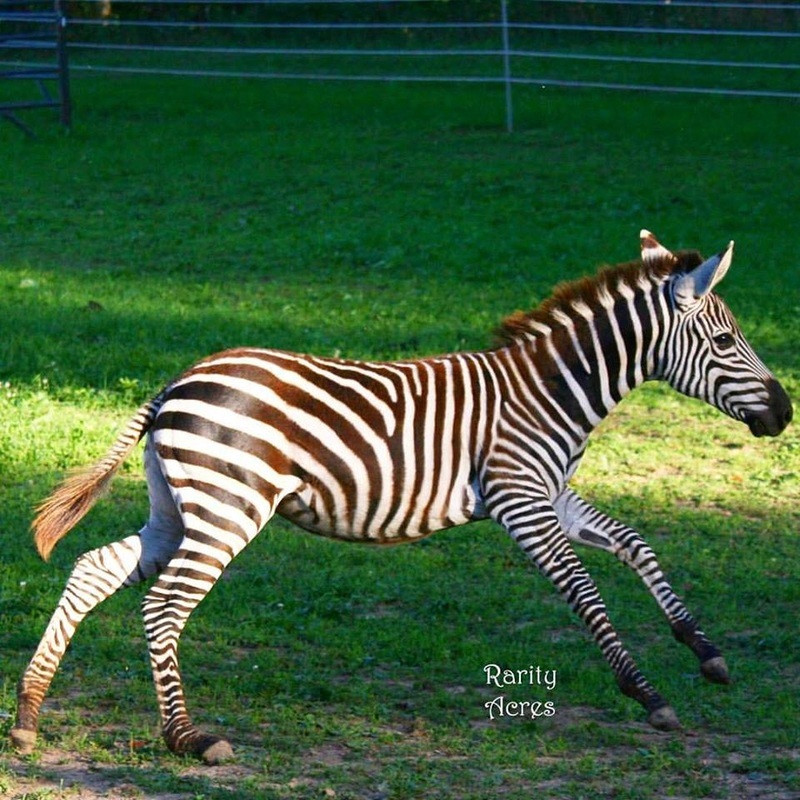 Experts disagree about those stripes—some claim that zebras have white skin with black stripes on it, while others claim that zebras have black skin with white stripes on it. ​Experts love to argue, don’t they? 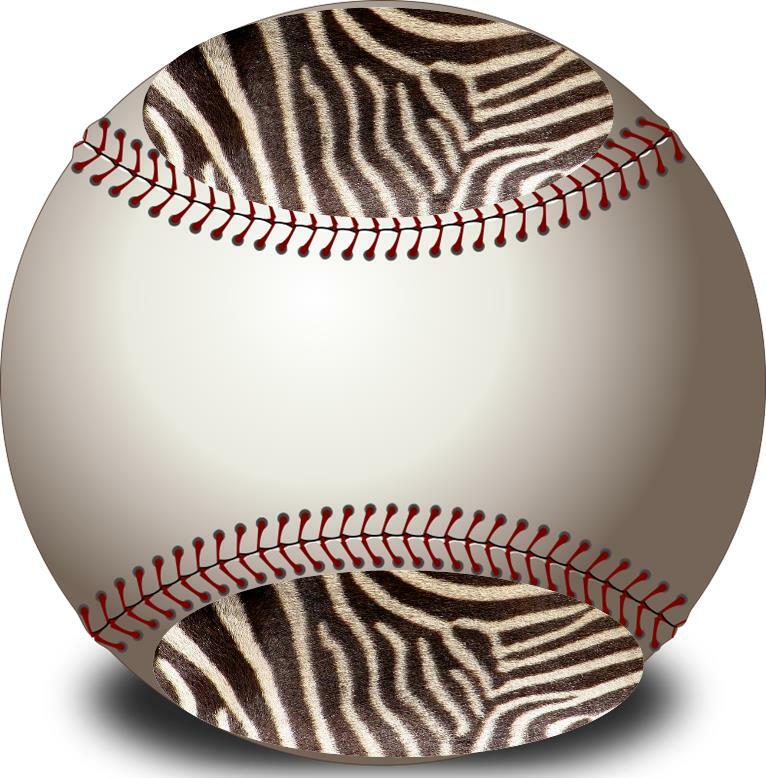 Either way, stripes are the zebra’s main claim to fame. Different types of zebras have different patterns of stripes, and each zebra’s stripes are unique, kind of like human fingerprints. The stripes can be narrow or wide, black or brownish, vertical or horizontal (or both!). 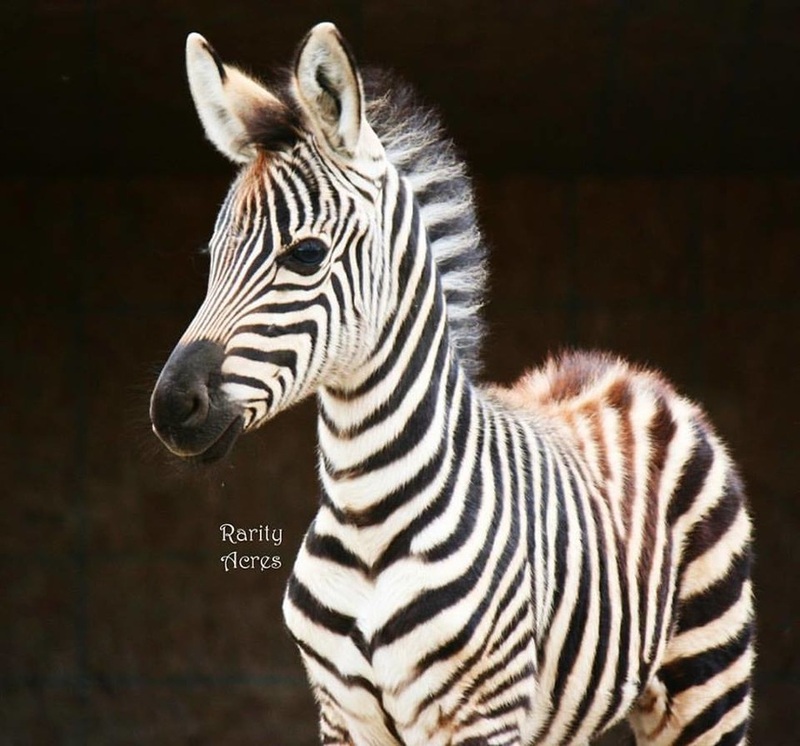 Their unique stripe patterns may help zebras identify each other, just as humans do. When your family gets together to celebrate a birthday or a holiday, you may all look similar (like zebras) because you’re all members of the same family, but you’re all different, too, in small or big ways. Some scientists think that insects like blood-sucking horseflies (who can carry diseases) may not like the looks of those stripes, so they take one look and fly off to find another victim. 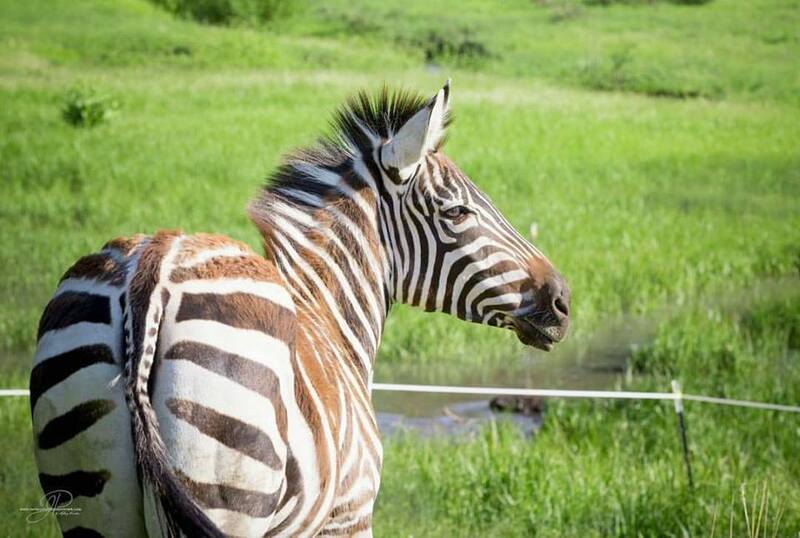 Others think that the stripes may work as a natural sunscreen for zebras living in flat, treeless places like the grasslands of Africa. Of course, zebras aren’t the only striped creatures on earth. 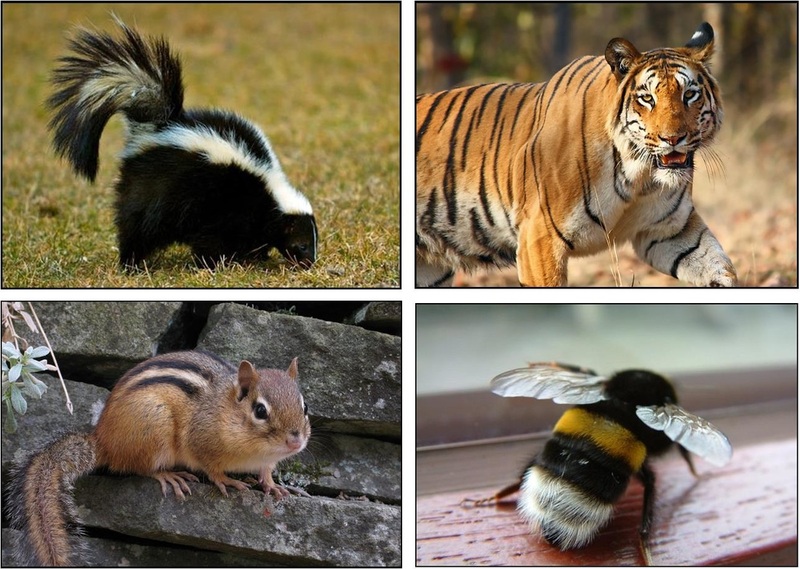 Tigers, chipmunks, fish, insects, skunks, you name it, many have stripes, and they’re not just there for decoration. 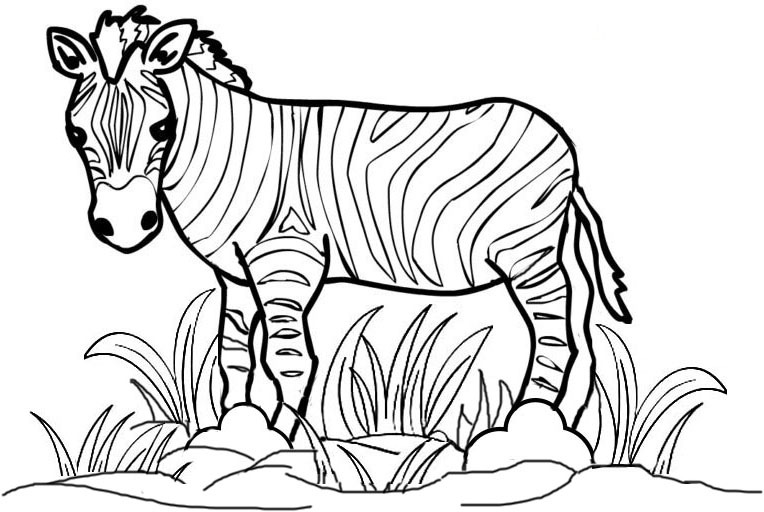 ​In the case of the zebra, stripes may act as camouflage. When a predator (like a lion, leopard, cheetah or hyena) who hunts zebras looks at a group of zebras, the stripes make it very hard to see how many animals are there and to figure out which one to attack. ​Look at them all! Where do you even begin? Who's that standing next to John? Is it Mike? Or Uncle Bob? But wait! That one looks a lot like Zoe...or is it Kate? or...no, that's got to be cousin Zelda, right??? 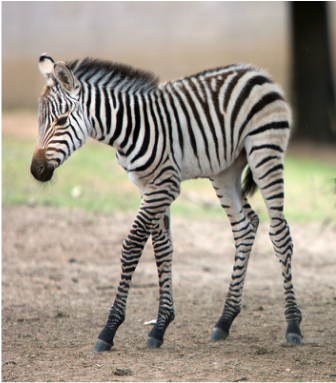 Zebras come in different sizes, related to what part of Africa they call home. Scientists call an animal’s home its habitat. It’s the place where the animal can find the food and shelter it needs to survive. The zebra’s habitat is the continent of Africa, in areas where they can find plenty of grass, leaves and twigs to eat and safe places to raise their families. 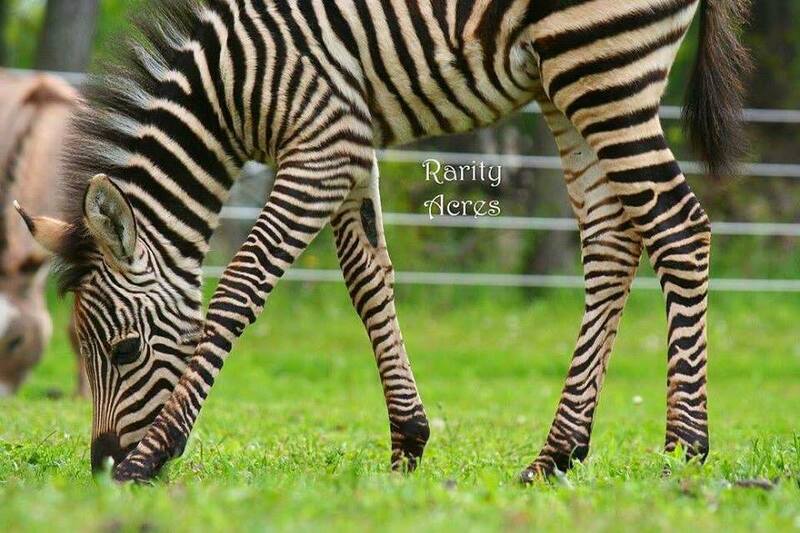 The Grevy’s zebra lives in the dry grasslands of African countries Ethiopia and northern Kenya, weighs 770 to 990 pounds and is about 5 feet tall from shoulder to hoof. It has a thick body that looks like its cousin, the mule. The plains zebra (including the Grant’s zebra like our friends Zena and Zimbee) lives in the grasslands of eastern and southern Africa. It weighs 400 to 700 pounds and is 3.6 to 4.8 feet tall. This animal is the “standard” zebra, and is the most common one in the world. The mountain zebra lives in the mountains of South Africa, Namibia and Angola, weighs 500 to 820 pounds, and is 3.8 to 4.9 feet tall. Aren't Zena and Zimbee adorable? Read further down the page to learn more about them. The plains and mountain zebras live in family groups led by a stallion who mates with several mares who carry and give birth to offspring, but the Grevy’s zebra don’t live in groups or herds at all. The Grevy stallion (a male zebra) lives in its own territory and mates with the mares who cross that territory. Once the baby zebras are old enough to travel, they and their mothers move on, searching for food on their own. Most zebras are social animals who prefer to hang out together and help each other avoid predators - the natural enemies who kill and eat zebras—and they have special ways of communicating with each other. It’s sort of like the way humans use spoken language to communicate. 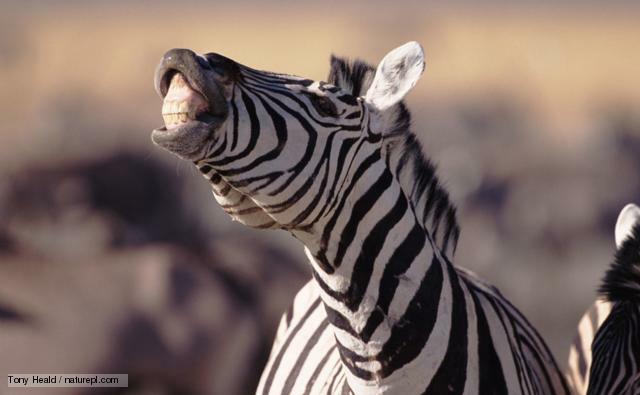 Instead of words, zebras use their faces, with wide-open eyes or bared teeth, and they also bark, bray, snort or huff to get their point across. Even the position of their ears can signal their feelings. For example, ears flattened toward the back means trouble. Zebras run away from their enemies not because they’re cowards, but because they’re smart. They have good eyesight, and when they spot a predator, they give a high-pitched snort to notify everybody of the danger. Then they stay together in their group and run off in a zigzag way, making it really hard for the predator to get at one member of the group. If it must fight, it will stretch out its neck, bare its teeth and bite or kick at the enemy. A zebra’s kick is very strong and can cause serious injury to a predator. The zebras being chased by a lion in the photo above are running so fast, they're just a blur. 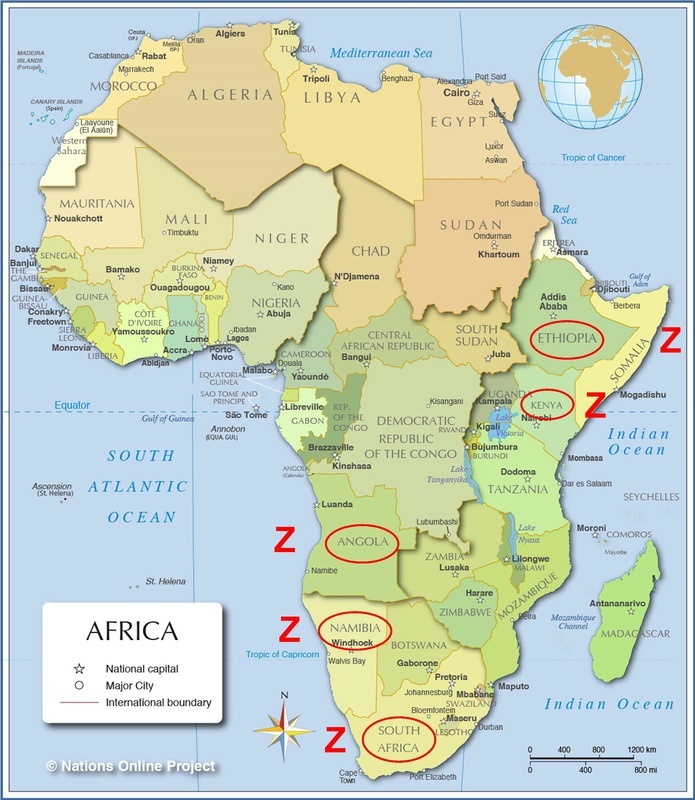 The red Z's on this map of Africa show the areas where wild zebras live. Click on the map to get a closer look. ​on his feet and walking! Female zebras (the mares) carry their young for 12 to 14 months. The babies weigh 55 to 88 pounds when they’re born. The newborn foals (girls) and colts (boys) are able to stand up and walk soon after birth. For their first year of life, they get milk from their mother, then gradually start eating grass. They become mature (adults) at 3 to 6 years old, and live for about 25 years. Click the photo above to visit Madison's Dancing with Zebras page on Facebook. Lots of great photos and videos there! Zebras can be gathered in the wild, raised in a zoo, and bred by humans, but they’re not tame—they always have a wild streak. Even though they look adorable, zebras cause more injuries to their human breeders and keepers than any other wild animal kept in captivity. Their inborn nature is to survive harsh living conditions and fierce predators like lions leopards, cheetahs or hyenas. They’re super alert and can get nervous in problem situations, such as feeling they're not in control or when they encounter another animal that's not friendly. Powerful, smart and sensitive, they don’t trust humans as easily as a domesticated horse does. Training a wild zebra is not an easy job. 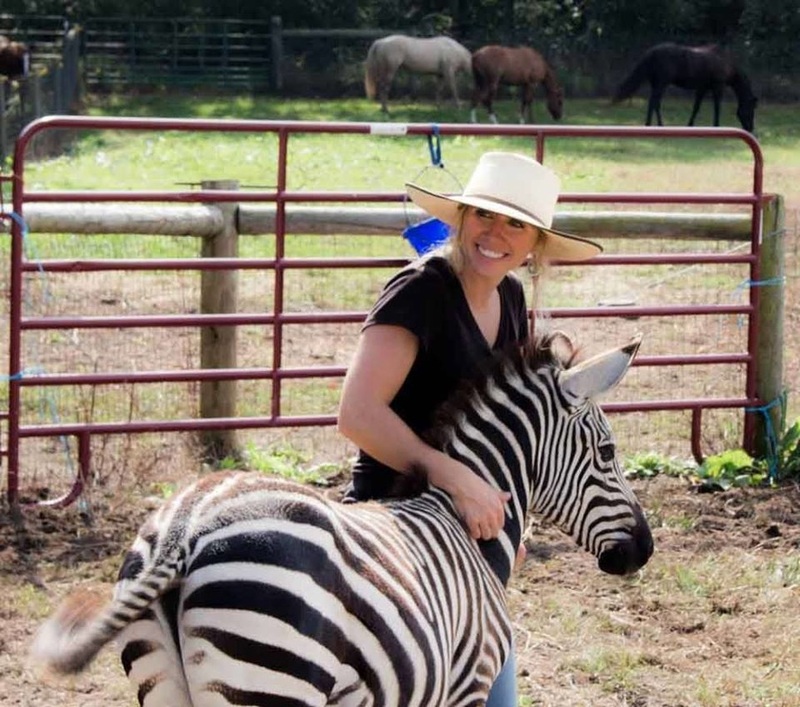 Professional trainer Madison Shambaugh raises and trains wild mustangs and zebras (zebras are genetic cousins of the horse). She is very patient and strong with them and helps them become partners with the humans who raise and keep them. 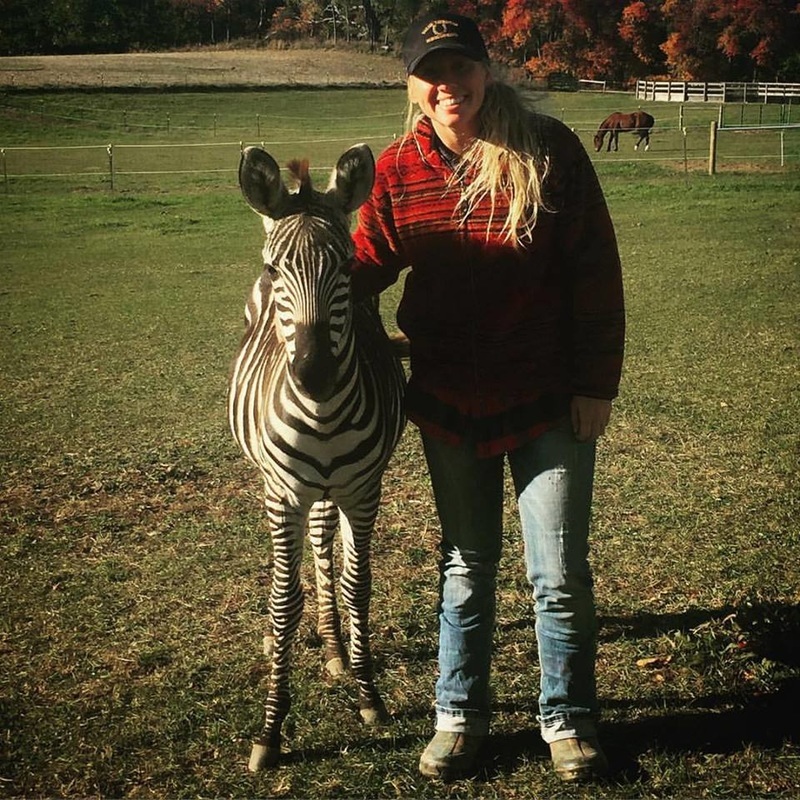 She started out with one zebra foal named Zena, then adopted a colt named Zimbee. Here he is in the photo below. Click the photo below to watch a video of Madison training Zimbee. ​When Zimbee was about 6 months old, Madison adopted baby Zeus. He'll go to live with Zena and Zimbee when he's weaned, at about 6 months old. Madison's first job with Zeus will be to "gentle" him so that he's used to being with her and can trust her more easily. Miss Zena during a visit to Colorado. Can you find baby Zimbee in this photo?! Those stripes make good camouflage, don't they? 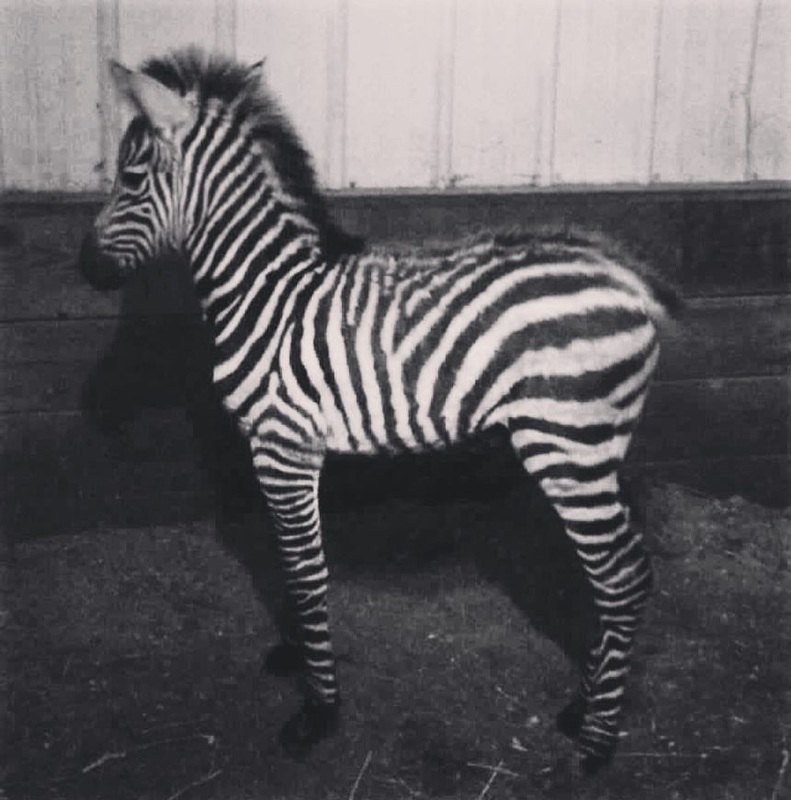 ​Zena, Zimbee and Zeus were born at Rarity Acres, a farm in the midwest USA that breeds zebras, horses, zorses, zonkeys, donkeys and ponies. Owner Timi Sebright loves equine animals, and as you can see in the photo above of a zonkey named Earl with Timi, they love her too. It takes a long time for a zebra, zonkey or zorse to trust a human being, so taking care of them and training them is a big job. Click on her photo to visit her website and see more photos of her animals. ZEBRAS, HORSES, ZORSES and ZONKEYS?!? What's your guess? Match the child with its parents. Look for the match-up answer further down on this page. Can you find words in this puzzle? Click the picture to print the puzzle. Click here to see the puzzle solution. 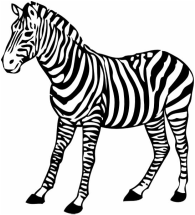 printable ​pdf version of the zebra. Do you have a question or suggestion that would make L'il Buckaroos even better? Want to learn something new? Something different? Anything at all? Well, you just go right ahead, click on the envelope, and send us a message.